يقع فندق BayBliss Apartments في منطقة تتمتع بمعالم كثيرة، وتعتبر المكان الأنسب لاكتشاف هذه المدينة رائعة الجمال و ما يحيطها. لا يبعد الفندق كثيراً عن مركز المدينة، فهو يقع على بعد 10 km منها. في حين يستغرق الطريق منها إلى المطار حوالي 45 دقيقة. يقع هذا الفندق الحديث على مسافة قريبة من المعالم السياحية الشهيرة. إن BayBliss Apartments حريص على توفير الراحة للنزلاء، فلا يوفر الموظفون جهداً في تقديم أفضل الخدمات وضمان حسن الاستقبال. يقدم العقار واي فاي مجاني في جميع الغرف, تسجيل وصول/خروج سريع, تخزين الأمتعة, صف السيارات, مرافق للشواء لضمان الراحة القصوى لضيوفه. ادخل إلى واحدة من الغرف 3 وتخلص من عناء نهار طويل بمساعدة مجموعة كبيرة من الخدمات كمثل تلفزيون بشاشة مسطحة, اتصال لاسلكي بالإنترنت, غرف لغير المدخنين, مكيف هواء, تدفئة الموجودة في بعض الغرف. يمكنك طلب اللائحة الكاملة للخدمات في الفندق ومن بينها حديقة. يحظى فندق BayBliss Apartments بموقع ممتاز وخدمات يصعب منافستها. A very comfortable stay. Good facilities, with full kitchen, handy. as Shute Harbour doesn't have any cafes or supermarket. Host very attentive. This is the best self catering accommodation that we have stayed at, in Australia. Make sure you bring supplies (food and drink) as the nearest shops are in Airlie Beach (only 10km away and easy to get to by car, taxi or the regular bus). The owners Berndt and Tess went above and beyond to make our stay hassle free; they are in the top percentile for excellent service and hospitality. We just stayed here one night before renting a yacht from Shute Harbour but wish we could have stayed another night. It's very peaceful after the madness of Airlie Beach, although because it's a 15 minute drive from there if you don't have a car and need to get about, that can be a bit of a problem. We had real issues trying to get a taxi to pick us up from here. Also don't get the Whitsundays shuttle bus from the airport to Bay Bliss, the bus is too big to get near the hotel so it drops you off at the top of the road and then you have to walk down a very steep road with your luggage which is not ideal! Brilliant spot at Shute Harbour, away from the hustle and bustle of Airlie Beach. 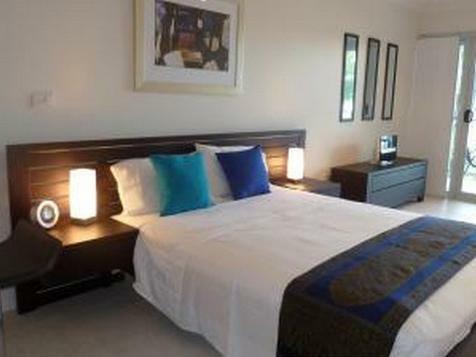 (10mins) Easy 5mins walk from the marina. Gorgeous views, lovely infinity pool. The owners, the views and the room and grounds...in other words, everything! Superb. We loved pour time at Baybliss. The views were outstanding and so were the rooms. we were looking for a quiet place to relax and we found it! baybliss apartments have a beautiful outlook across shute harbour and a world away from airlie beach (a 10 minute drive away) which whilst well serviced by good restaurants etc would not have suited our need for peace and quiet. it was very wet the 7 days we were there in february but still, there's plenty to do and see if you have a car. Tout est parfait sauf l'isolation phonique : nous entendions tout ce qui se passait dans la chambre voisine... pas vraiment agréable.